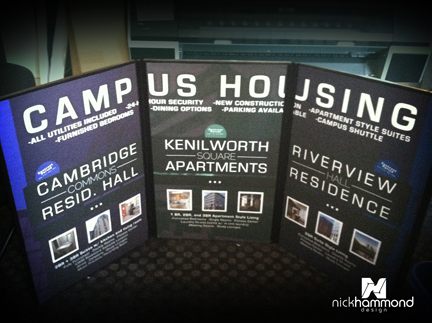 This project was done for the University of Wisconsin-Milwaukee and their Housing department. 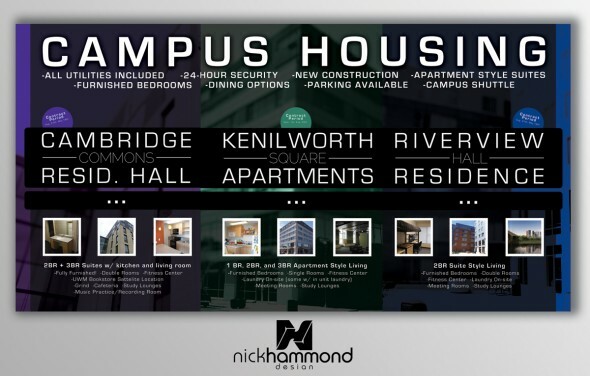 Housing consists of five different “Dorms”, all of which are labeled in creative ways in order to do away with the negative connotations of the word. The tri-fold you see below was designed in conjunction with a brochure (to be released at a later date) for use in New Freshman Orientation days where booths are set up in order to better explain University services. Each section comes in at 22×34 inches with a total dimension of 66×34 inches when put together.